1. AGA Cooker. Well it had to be number one and is the reason I clean so many of them. They are far better, and easier to clean that a double oven range cooker, and you get a great feeling from the result and so does the customer, and they pay accordingly. Really the AGA was how I got into oven cleaning and if I could clean them everyday I would. 2. The Mercury Double Oven Range. A fantastic looking cooker with the great electronic knobs that contol the burns. Easy to clean as it hasn't been around for too long and the ones I have seen so far haven't required a full strip down – though of course this may change over time. 3. The Rangemaster 110. Every body who has one seems to love them and we just see lots and lots of them. Easy doors to clean as sealed – though I have been told that the newer ones have slits in the sides; oh dear. 4. The Bosch standard double oven. It usually is a relatively easy clean and as the doors are sealed there isn't a requirement to take the door apart and clean inside and if you have to it is just a case of flipping the glass off. It has that 'easy clean' grey enamel which needs some work but the end result is special. 5. The AEG standard double oven – Again easy access to door glass and oven bits are a dream to clean. You probably can see a trend here it's the nice quality standard doubles with lots of self cleaning bits and sealed doors I like and the top three are all made by the same company are made by AGA Rangemaster. I don't like all of their products by the way, the AGA Master Chef is a really awful range which is very cheap finish and feel. I actually recorded this last June but here it is, me talking about the exciting subject of bulkheads for oven cleaning vans, or I suppose any work van of sorts.Really it is a good idea to have one or else you can find that you get something embedded in the back of your head after an emergency stop. Which Coffee#1 Was OvenGleam at Last Week? 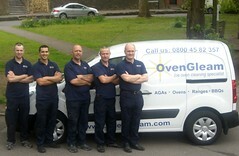 Oven Gleamers Oven Cleaning Franchisees Are Go! In my last post I referred to Matt but didn't load up his photo. So here it is. Matt Reilly OvenGleam's oven cleaner of the year 2010. And also picture of all of The Oven Gleam Team outside our office with our Childline Charity barometer in the background for the NSPCC 1600 club of which we are a member. We are looking a bit dirty but it was last Thursday and we all had been out cleaning ovens, including me. Last year we started this competition and awarded employee of the week and van of the week to the employee with the best van and employee with the best testimonials, sales of oven liners, up-sells of jobs etc. Matt, although he started in August, out performed everyone to get his award getting regular great testimonials and doing a sterling job selling oven liners and get people to fill out our VIP forms. Both operatives were awarded a cash prize of £300. This year we are doing the competition differently still with weekly awards but we are giving out the prize every 13 weeks. We thought this would allow everyone to compete for the prize as what happened last year was that guys lost interest if they got behind in the rankings. The first photo is all of The Oven Gleam Team and you can see that we were perfectly sized by Catherine before she took the photo - her RAF background showing through. I have been sized myself since I was back in the RAF myself! New Year Resolution – Clean the Oven more than twice a Year! We at OvenGleamers.com are offering you the opportunity to be in control of your future by starting your own oven cleaning business. We we will train you and you will be up and running straight away and ready to clean ovens as an OvenGleamers franchise business owner. As we have had a multi van operation ourselves since 2005, (having started with just me in a van in 2004) we can also provide you with information to manage a multi van operation, from recruitment of staff, management of staff and the placement of work contracts. Why an oven cleaning business? Well as an oven cleaning business is van based and as you’d be working from home it is fabulous in that you can schedule your jobs to work around your family and social life. Really you will be able to remove the stress of 9 to 5 working and no longer have to commute to work and not have to deal with, if you have been a manager, staff problems and issues. In a way a new life for you. Cleaning isn’t stressful at all and you get immediate positive feedback from every client. We will give you the best in oven cleaning training, enabling you to understand and operate your business with confidence and have an excellent start and momentum you need for a successful business. The oven cleaning business is in a sustainable and ever growing market, as every home has a cooker, hob or extractor in need of cleaning. We will offer you a tried and tested business format built up and finely tuned over six years of operating a multi van oven cleaning business – we currently have five vans in operation. This a fabulous business opportunity for any hard working and ambitious individual. There are franchise companies offering a similar business opportunity. However, we believe that by helping you start your own OvenGleamers franchise operation we can help you achieve your goals without spending too much on both start up costs and monthly management fees. We offer you training in the best processes and techniques in operation in the business, the best equipment, and we use both superior products and spare parts. We consider that this makes this opportunity the BEST franchise opportunity in the industry. This business is easy for you to manage especially with our call centre taking your calls during the day for you. It provides you with repeat business (some customers look at getting their ovens cleaned every few months) . It has low overheads and you may work from home. Has an excellent potential for turnover and profit. It can be owner operated, man in van, or multi van operation. We offer a fabulous start up cost – Our fee starts at £16995 plus VAT for the standard franchise package. Our minimum cost package provides you with 60,000 households and your van is set up ready to operate on completion of your franchise business training. Our electrically heated oven cleaning dip tank giving you the best in equipment that you need to run a fast and efficient oven cleaning business. Our comprehensive two week training course includes AGA cooker cleaning specialist training, which we feel will give you an advantage over your competitors. Support will be provided by phone and our unique OvenGleamers Academy Training site which gives you access to training videos by me. Superior products that are child and pet friendly. Expert marketing help. Full operations manual. Our branding and advertising materials. Our course is ten days long and you will learn everything you need to know to clean ovens, range cookers, extractors, AGA cookers and start your business with a bang. We provide a local business launch in your area and extensive internet marketing. Now go back to the oven cleaning business home page of the blog to do Step Two. 1. Lancache Range – this is a quality range which is a semi professional build which means it is a solid range cooker. So why do I hate cleaning it so much? Well it has ribbed sides in the ovens, it sometimes has stainless steel panels on the inside of the doors and on the roof/ceiling of the ovens. Both are difficult to clean, though I do get the doors to gleam and the roof/ceiling of the ovens are difficult to get 100%. Really as they are stainless steel you can't use the scraper to get the carbon of them, though a bit of water and back scraping does get most of it off. Also the Lacanche ranges don't have lights inside the ovens so it is difficult to see the results, and there is a ridge just inside of the ovens that I tend to miss! Though I have got wise to this now and it is the first bit I clean. If you are looking at one of the ovens, with the door down, it is at the top and is the first place anyone would run their finger across if they were checking it. As the top pan racks are solid they are heavy and I usually do a separate trip just to take them out to the van to dip them. So in all I find cleaning Lacanche's heavy and hard work. 2. Baumatic cookers– This is my number two as any oven, range, cooker with this branding will suffer from the same problems – they are all just poor in construction which means things will be falling off, falling apart, sticking together and generally causing problems during the clean. The Baumatic ranges are the cheap ranges that look good for the short term but are for the long term. 3. Beko – really the same problem as the Baumatics as they are poor in quality and things will fall apart as you clean them; look out especially for the nuts that hold in the side racks that can easily fall into the inside of the cooker – only way to get it out is to turn the cooker upside down!! You need two people obviously to lift the cooker – Health and Safety – though it has only happened once to us and it was five years ago. 4. SMEG cookers – same again as 2 and 3 though this time as the customer has paid a bit for them they don't understand it when they are falling apart and think it must be the cleaner!. Things that go wrong with SMEGS: transfers coming off the fascia, knobs falling apart, racks rusting, digital clocks going wrong, seals breaking, paint on inside of doors going white, grease getting into the middle of the sealed glass in the door! 5. Neff – for the ribbed sides on some of the models and the hinges that seem to wear quickly and you need to be on the ball to notice before you clean them, and point out to the customer before you clean it. Here is a video of me cleaning two AGA cookers in Salcombe in Devon in October 2010. The first one was particularly bad but the second one wasn't. The Tunnels didn't come up 100% as they are very difficult to clean but we will be able to get them better when we clean it again this Summer! I think I persuaded the owner that 17 years is too long to wait to get the AGA cleaned and it would be wise to get it cleaned at least once a year and that we clean an AGA every August in Salcombe (we have been cleaning it every year since 2003 a two oven AGA, a standard double oven, a hob and extractor) so could clean it at the same time. So if you watch this video and think that it would be easy to clean the top of your AGA can I just point out that really you need brand new ultra sharp blades to get the grease off. You need to change them reguarly to ensure that they are kept sharp. The scraper they sell in the AGA shop is okay for keeping your AGA clean on a day to day basis but really isn't something to use to get the thick stuff off because a few scrapes and the blade will be blunt. If the blade is blunt then it can damage the enamel on the top of the AGA. Really call in a professional AGA cleaning company such as ours to clean it for you. Here is an oven I cleaned last Thursday in Bristol and it was a challenge but it turned out looking great. The pictures here do not really show how dirty it was at the beginning and it took a lot of work around the fan area. The oven had an aluminum area at the back behind the fan so it needed a bit of work to get all the carbon off of that. As the fan was stainless steel it came up perfectly well after being dipped in the tank. I dipped the self cleaning parts, all of them came out very easily with the side panels and ceiling panel just sliding out and the back panel had just four screws.